Railpictures.ca - Ryan Gaynor Photo: 60 kilometres south of their station stop at Sudbury Junction, VIA Rail’s flagship train, “The Canadian” is seen racing across the muskeg of Northern Ontario at mile 96.4 of the Canadian Pacific Parry Sound Subdivision. For roughly 130 kilometres, CP’s mainline more or less parallels the Trans-Canada Highway, making for an exciting chase through the beautiful and rugged Shield country. The Canadian, of course, was a fantastic subject to follow on my travels North. | Railpictures.ca – Canadian Railway Photography – photographie ferroviaire Canadienne. 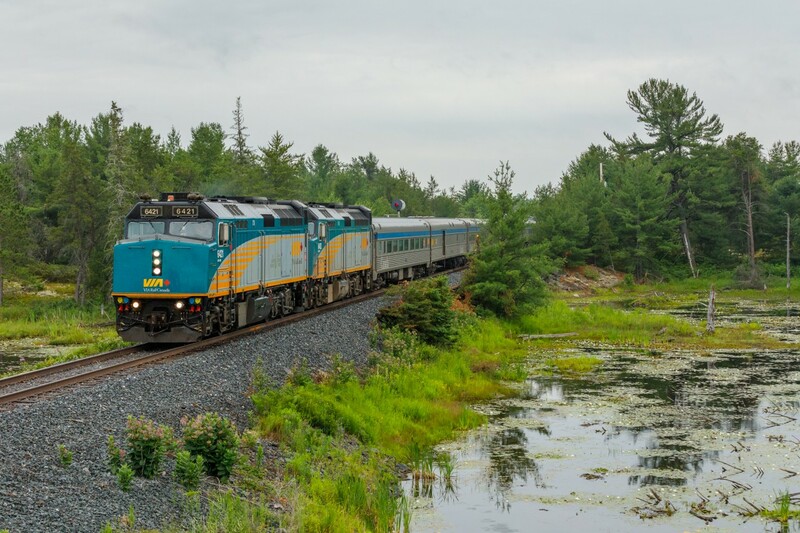 Caption: 60 kilometres south of their station stop at Sudbury Junction, VIA Rail's flagship train, “The Canadian” is seen racing across the muskeg of Northern Ontario at mile 96.4 of the Canadian Pacific Parry Sound Subdivision. For roughly 130 kilometres, CP’s mainline more or less parallels the Trans-Canada Highway, making for an exciting chase through the beautiful and rugged Shield country. The Canadian, of course, was a fantastic subject to follow on my travels North.